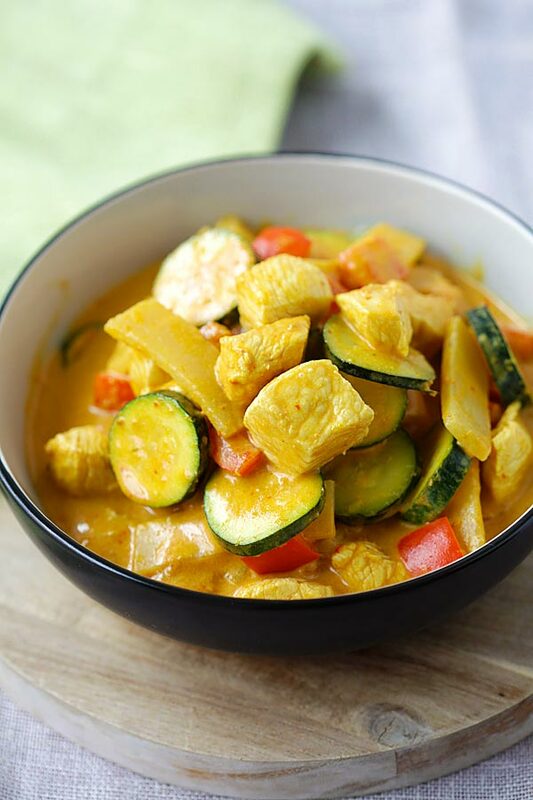 My yellow curry is loaded with a variety of ingredients such as bamboo shoots, red bell pepper, zucchini and chicken. It’s a balanced meal and you can just make a big pot of the curry and serve it with rice, and you will have a wholesome meal to feed the family. Heat the oil in a small pot over medium heat. Add the yellow curry paste. When you smell the aroma from the curry paste, add the chicken, bamboo shoots, zucchini and bell peppers into the pot, stir to combine well with the curry paste. Add the coconut milk, water, and cover the pot with its lid. Let cook for about 3 minutes or until all the ingredients are cooked. Add the fish sauce, sugar, and stir to mix well with the curry. Turn off the heat and serve the curry immediately with steamed jasmine rice.